If you were lucky enough to catch Beast In Black supporting Nightwish at the tail end of last year you’ll already know what a vibrant and exciting band they are, barely pausing for breath as they romped through a set of bop-till-you-drop power metal designed to put a bounce in your step and a smile on your face. On album they lose none of their stomp nor swagger, punching the air with huge, European, chest-beating anthems, and ‘From Hell With Love’ is a hugely enjoyable outing which follows on pretty much where their 2017 debut ‘Beserker’ left off. Sitting very comfortably on the lighter side of the metal spectrum – you wouldn’t be surprised if almost any of the eleven cuts on offer turned up on the Eurovision Song Contest – ‘From Hell With Love’ serves up forty-plus minutes of catchy, extremely accessible, exceptionally well-played material. Much of the band’s appeal lies with hyperactive Greek frontman Yannis Papadopoulis, whose wide range and effortless delivery lends the material a variety lacking in many other bands. While Beast In Black have already carved out their own almost instantly-familiar sound, within their own camp the Finnish/Greek/Italian combo’s material does have a wide array of styles: recognisable, yes, but perhaps not so easy to pigeon-hole. 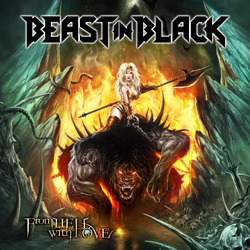 The well-crafted and superbly-executed songs flow effortlessly and although the obligatory ballad ‘Oceandeep’ does drag things down a bit after that it’s freewheeling all the way with a clutch of more uptempo material (‘Unlimited Sin’ and ‘This Is War’ being prime examples) which puts Beast In Black back on track. And saving the best till last ‘No Surrender’ crackles with energy and romps home to take first place. I’d be lying if I said there was much difference between ‘From Hell With Love’ and its predecessor, but then again, why mess with a winning formula? There’s a digipack version, by the way, with a couple of bonus tracks (‘Killed By Death’ and ‘No Easy Way Out’) which is the one to splash the cash on.